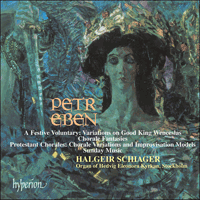 Those who have been following Halgeir Schiager’s pioneering survey of Petr Eben’s extraordinary organ works will find any words of recommendation for this new disc unnecessary; for the newcomer, the twelve Protestant Chorales at the heart of this recital will provide an excellent starting-point—the most literally contemporary (composed in 2000) music in the cycle, and yet reassuringly rooted around the traditional chorale melodies of the Church. Petr Eben is one of the foremost composers from the Czech Republic. Also known as an organist, he primarily performs his own works, but is also highly sought-after as an improviser on both the piano and the organ. His works for organ are among his most popular. Petr Eben is one of the foremost composers from the Czech Republic. His reputation extends well beyond his native country and his works are frequently performed. He was born on 22 January 1929 at Zamberk and grew up in Cesky Krumlov in Southern Bohemia, where he learned to play both the piano and the organ. During the war he was sent to Buchenwald concentration camp, and once hostilities had ceased he began to study the piano and composition at the Prague Academy of Music. Since 1955 he has taught in the Department of Musical Theory at Charles University in Prague, and since 1990 has been a professor at the Academy. Although composing forms the central focus of his activity, he also gives many concerts – primarily performing his own works – and is much sought-after as an improviser on both the piano and the organ. In this capacity he performs at festivals throughout Europe, America and Australia. Despite his creative diversity, Petr Eben devotes himself to two particular areas of composition: choral and organ music. Petr Eben was awarded an Honorary Fellowship of London’s Royal College of Organists in 2000. I wrote A Festive Voluntary (Variations on Good King Wenceslas) in response to a commission from the Southern Cathedrals Festival for the re-opening of the Chichester Cathedral organ. My immediate thoughts as to the main character of this work are clear: it should be festive, joyous and display the richness and diversity of colours of the instrument. Thus I decided to write a continuous set of variations with varying combinations of stops, especially the reeds. Looking for a theme for the variations, I wanted to find something that would connect my country with Great Britain. I found this in the person of our King and national saint and the English medieval tune based on the lovely carol ‘Good King Wenceslas’. I took this tune as the basis for the Voluntary, in the hope that the joyfulness of this melody would be reflected in my variations. ‘Amen, es werde wahr’ was commissioned by the German publishing house of Möseler, to be included in the volume of organ music entitled ‘A Chorale by contemporary composers’. The editor divided the nine verses of ‘Vater unser im Himmelreich’ among nine composers, and asked them each to compose a movement, in order to create a powerful Lutheran piece. I was assigned the last verse, beginning with the words ‘Amen, es werde wahr’. I composed a series of variations on the Chorale theme which rounds off the collective work. The Protestant Chorales explore the art of improvisation – once expected from every musician, now all-but gone from the concert hall, thanks to increasing specialization by both composers and performers. Musical improvisation was once a required part of the training of every musician; this is no longer so. At least in one area, however, improvisation has survived and is still an important factor in both the training and concert practice of musicians for this instrument: the organ. The tradition of improvisation has survived in organ playing while being lost to almost all of the other forms of music performance with the exception of jazz. I think this is particularly regrettable, because improvisation belongs to the most delightful forms of musical diversion. Very little else can compare to the pleasure of sitting at an instrument, laying the music aside, and just carrying on a dialogue with the instrument. There are, however, three fundamental prerequisites for improvisation, one of which the musician must be born with: harmonic conception. Musicians who don’t have this capability have to resort to theoretical knowledge of harmony to improvise melodies and modulations. The result is usually sluggish improvisation that is too complicated and intellectual. Both of the other prerequisites can be learned. One is technical agility in playing the instrument, and the other is spontaneity of thought processes in relation to the knowledge and mastery of the instrument, the rules of thematic development, the formal construction, the various styles etc., making it possible rapidly to coordinate all of these elements. The organ is an instrument particularly suited to improvisation, since the player not only has a number of keys available under his hands and feet but also a variety of colours; and the opportunity for the pedal to be able to play an additional melodic line gives scope to enrich the musical expression further. The Protestant Church of the Bohemian Brothers contacted me in the years after 1960. At that time a new, extensive edition of the protestant hymn book with several hundred chorales was being prepared. Naturally, many of the chorales from earlier editions, which were written exclusively in four-part harmony, were used. Since these were arrangements dating from earlier centuries, the Bohemian Brothers wanted to make a point of including several chorales with newer, more modern accompaniment in the new edition. I was requested to set a series of chorales in a modern but not too dissonant style. Every chorale is also accompanied by a short improvisation model to demonstrate the technique. These are, of course, not concert improvisations but rather short preludes and interludes for the chorales. When I quote melodies in a concert improvisation, I don’t merely use the melodic material but also employ my own themes. In these chorales, I concentrate exclusively on the themes of the particular piece and always finish in its key so that another verse can be sung. ‘Habent sua fata libelli’ (‘Books have their own fate’) wrote Ovid. And the same certainly applies to music: compositions have their own destinies that can never be anticipated. I wrote Sunday Music for organ between 1957 and 1958 at a time when few people showed any interest in organ music. Indeed, concerts in churches were generally not allowed, and concert halls with an organ were comparatively rare. All my colleagues shook their heads and said it was a nonsense. But I felt deeply that I had to write something for the organ, even though I was aware that the work might languish in the drawer of my desk. But contrary to all expectation, it was not long before the piece received its first performance, was published and soon appeared on record in many different countries – thus becoming, quite unexpectedly, my most frequently performed work. I intended the title ‘Sunday Music’ – Musica dominicalis – to imply that this was not everyday music but a work of celebration. From a formal point of view, it is an organ symphony in four movements. The first movement adapts in a highly concentrated way a Gregorian theme, ‘Ite, Missa est’, that is played every Sunday of the year and therefore lends itself to Sunday music. I use both motifs of this theme to form a stark contrast: ‘Ite’ is first played tutti, ‘Missa est’ piano; and later in the piece the ‘Ite’ is played on the pedals, and the ‘Missa est’ on the manuals. It goes without saying that I treated the Gregorian themes freely, enabling me to employ quicker rhythms. The movement ends with a bitonal cadence, after which the theme is heard once more, played tutti and with thick chords. The slow and quiet second movement features two themes which, although they are not quotes, resemble Gregorian music. The movement moves to a mighty climax, and after a few chords the theme from the first movement rings out once more like bells. Just as the two Fantasias are linked by a common theme, so the final two movements are connected through mood. The third movement of a symphony is usually a scherzo. The third movement in this piece is characterized throughout by a pronounced rhythm: the wars and struggles described in the Sermon on the Mount and the Apocalypse wash over humanity. A new theme to the same rhythm is heard alternately in the descant and on the pedals. The Finale is based on a free adaptation of the first subject of sonata form, with its exposition, development and recapitulation. The virtuoso bass figure at the outset depicts the gradually receding noise of battle, which is followed – also on the organ – by a dramatic trumpet fanfare that summons the survivors after the battle. The ‘Kyrie, lux et origo’ from the Easter Mass is heard pianissimo as a secondary theme. Sometimes I adapt a Gregorian theme, increase the intervals and use them in different tonalities. The distant sound of battle is heard again in the development section, the first theme appears again in the recapitulation, powerfully this time on the manuals and later on the pedals; and a new theme appears in the coda, symbolizing all positive aspects of existence. The beginning of the celebrated Marian antiphon ‘Salve Regina’ brings the work to a hymn-like close. It is nothing less than the victory of good over evil, culminating in a hymn-like praise of the Creator. Petr Eben est l’un des principaux compositeurs de la République tchèque – sa réputation s’étend bien au-delà de sa terre natale et ses œuvres sont fréquemment jouées. Né le 22 janvier 1929 à Zamberk, il grandit à Cesky Krumlov (Bohême du Sud), où il apprit à jouer du piano et de l’orgue. Déporté au camp de concentration de Buchenwald durant la guerre, il entreprit, à la fin des hostilités, d’étudier le piano et la composition à l’Académie de musique de Prague. Depuis 1955, il enseigne au département de théorie musicale de l’Université Charles de Prague et est aussi, depuis 1990, professeur à l’Académie. Quoique la composition constitue l’essentiel de son activité, il donne également beaucoup de concerts – où il interprète surtout ses propres œuvres. Il est un improvisateur fort recherché, au piano comme à l’orgue. À ce titre, il participe à des festivals dans toute l’Europe, en Amérique et en Australie. Au sein même de sa diversité créatrice, Petr Eben se consacre à deux grands domaines de composition: la musique chorale et la musique pour orgue. J’ai écrit A Festive Voluntary (Variations sur «Good King Wenceslas») en réponse à une commande du Southern Cathedrals Festival de Grande-Bretagne pour l’inauguration de l’orgue de la cathédrale de Chichester. J’ai immédiatement pensé qu’il fallait que dans son caractère général cette œuvre soit festive, joyeuse. Elle se devait d’illustrer la richesse et la diversité des couleurs de l’instrument. C’est pourquoi j’ai décidé d’écrire une partition enchaînant des variations où les jeux puissent être associés en différentes registrations, notamment les jeux d’anches. A la recherche d’un thème pour ces variations, je souhaitais trouver quelque chose associant mon pays à la Grande-Bretagne. Je l’ai trouvé en la personne de notre roi et Saint national et dans un chant anglais du Moyen-âge élaboré sur le charmant Noël «Good King Wenceslas». C’est cette mélodie que j’ai retenue pour écrire ce Voluntary dans l’espoir que sa gaîté se reflète dans mes variations. «Amen, es werde wahr» a été commandité par l’éditeur allemand Möseler pour faire partie d’un recueil de musique pour orgue intitulé «Un choral par des compositeurs contemporains». L’éditeur avait divisé les neuf versets de «Vater unser im Himmerlreich» parmi neuf compositeurs, chacun devant en écrire un mouvement, afin de créer une œuvre luthérienne forte. On m’avait donné le dernier verset, celui qui débute par les mots «Amen, es werde wahr». J’ai écrit une série de variations sur le thème du Choral afin de conclure cette œuvre collective. Chorals évangéliques: Il fut un temps où tout musicien devait être versé dans l’art de l’improvisation. De nos jours, cette pratique a quasiment disparu de la salle de concert, du fait de la spécialisation croissante requise chez les compositeurs et musiciens. Si l’improvisation musicale faisait auparavant partie de la formation de tout musicien, tel n’est plus aujourd’hui le cas. Il est pourtant un endroit où l’improvisation a survécu et demeure un facteur important de la vie du musicien aussi bien dans sa formation qu’au concert: l’orgue. La tradition de l’improvisation s’est ancrée dans la pratique de cet instrument même si elle a disparu de presque toutes les autres formes d’exécution musicale, à l’exception du jazz. Je pense que c’est vraiment dommage. L’improvisation est l’une des formes de divertissement musical les plus exquises. Rien n’est véritablement comparable à la joie d’être assis devant son instrument, d’écarter toute partition et d’entamer un dialogue avec l’instrument. Trois qualités sont cependant nécessaires pour improviser – et pour l’une d’entre elles, le musicien doit être né avec: le sens harmonique. Les musiciens qui en sont dépourvus doivent faire appel à une connaissance théorique de l’harmonie afin d’improviser les mélodies et de moduler. Il en résulte généralement une improvisation trop compliquée ou trop intellectuelle. Les deux autres éléments peuvent être appris. L’un est l’agilité technique dans le jeu de l’instrument, l’autre la spontanéité des procédés d’invention en relation avec le savoir et la maîtrise de l’instrument, les règles du développement thématique, la construction formelle, les différents styles ,etc. bref, ce qui rend possible la coordination de tous ces éléments. L’orgue est un instrument qui convient particulièrement bien à l’improvisation. L’Eglise protestante des Frères de Bohême m’a contacté quelques années après 1960. A l’époque, une nouvelle édition des cantiques protestant était en préparation, comprenant plusieurs centaines de chorals. Bien entendu, bon nombre de ces chorals étaient repris d’éditions antérieures écrites exclusivement dans une harmonie à quatre voix. Puisque ces arrangements dataient des siècles précédents, les Frères de Bohême se firent un point d’honneur à incorporer dans la nouvelle édition plusieurs chorals dotés d’accompagnements plus modernes, plus novateurs. C’est alors que j’ai été sollicité afin de réaliser une série de chorals dans un style moderne mais pas trop dissonant. Chaque choral est également accompagné d’un modèle destiné à illustrer la technique requise pour réaliser une courte improvisation. Il ne s’agit nullement d’improvisations de concert, bien entendu, mais plutôt de préludes ou d’interludes concis pour les chorals. Quand je cite des mélodies lors d’improvisations de concerts, je n’essaie pas de me servir que des seuls éléments mélodiques mais aussi d’y incorporer des thèmes qui me sont propres. Dans ces chorals-ci, je me concentre exclusivement sur les thèmes de l’œuvre spécifique et je m’attache à conclure dans la même tonalité de sorte qu’un autre verset puisse être chanté. J’ai écrit Musique dominicale pour orgue entre 1957 et 1958 à une époque où personne ne se souciait de la musique d’orgue. Effectivement, les concerts dans les églises n’étaient généralement pas autorisés et les salles de concert dotées d’un orgue étaient relativement rares. Tous mes collègues ont hoché la tête en disant que cela n’avait aucun sens. Mais j’éprouvais le besoin profond d’écrire quelque chose pour cet instrument même si j’avais conscience qu’en toute probabilité, ce qui en résulterait aurait toutes les chances de prendre la poussière au fond d’un tiroir de mon bureau. Contrairement à toutes mes attentes, cette partition a rapidement vu le jour. Elle a été publiée et enregistrée dans différents pays pour devenir ma composition la plus jouée! J’avais retenu le titre de «Musique dominicale» – Musica dominicalis – pour faire comprendre que ce n’était pas une musique de tous les jours mais une œuvre de célébration. Du point de vue de la forme, il s’agit d’une symphonie pour orgue en quatre mouvements. Le premier mouvement adapte de manière hautement concentrée le thème grégorien «Ite, Missa est» joué chaque dimanche de l’année et qui sied donc à une musique dominicale. J’ai utilisé les deux motifs de ce thème pour former un contraste vivide: «Ite» est d’abord joué tutti, «Missa est» piano. Plus tard dans le déroulement de l’œuvre, «Ite» est exécuté au pédalier et «Missa est» aux manuels. Cela va sans dire que j’ai traité les thèmes grégoriens avec beaucoup de liberté ce qui m’a permis d’utiliser des rythmes plus rapides. Le mouvement s’achève sur une cadence bitonale après quoi le thème est énoncé à une seule reprise, tutti, avec des accords fournis. Le deuxième mouvement, lent et paisible, exploite deux thèmes qui ressemblent à du plain-chant sans pour autant être des citations. Le mouvement évolue vers un apogée puissant. Après quelques accords, le thème du premier mouvement est énoncé une dernière fois, avec des tintinnabulements de cloches. Tout comme les deux fantaisies sur des chorals étaient associées par un thème commun, les deux derniers mouvements sont parents de par leur atmosphère. Le troisième mouvement d’une symphonie est généralement un scherzo. Dans cette œuvre, il se caractérise par un rythme marqué présent durant tout le mouvement: les guerres et les luttes décrits dans le Sermon sur la Montagne et dans l’Apocalypse parcourent l’humanité. Un nouveau thème écrit sur le même rythme est énoncé alternativement au dessus et au pédalier. Le Finale est conçu sur une adaptation libre du premier thème d’une forme sonate, avec son exposition, son développement et sa réexposition. Le motif virtuose de la basse énoncé au début illustre le bruit de la bataille qui s’éloigne progressivement. Il est suivi – toujours à l’orgue – d’une fanfare dramatique de trompettes qui appelle les survivants après la bataille. Le «Kyrie, lux e origo» de la Messe pascale est énoncé pianissimo, comme thème secondaire. Parfois, j’adapte le thème grégorien, augmentant les intervalles et les utilisant dans différentes tonalités. Les sonorités lointaines de la bataille sont une fois de plus évoquées dans le développement. Le premier thème apparaît de nouveau dans la réexposition, exécuté avec force cette fois aux manuels, puis ensuite au pédalier. Un nouveau thème apparaît dans la coda, symbolisant les aspects positifs de l’existence. C’est le début de la célèbre antienne mariale «Salve Regina» qui conclut cette œuvre sur des allures d’hymnes. Voici rien de moins qu’une victoire du bien sur le mal, culminant dans une louange en forme d’hymne au créateur. Petr Eben gehört zu den führenden Komponisten der tschechischen Republik. Seine Werke sind auch ausserhalb der Grenzen seines Landes wohlbekannt, oft aufgeführt und fast alle auf Schallplatten aufgenommen. Er wurde am 22.1.1929 in Zamberk geboren, und wuchs im südböhmischen Cesky Krumlov auf, wo er Klavier- und Orgelspiel erlernte. Nach seiner Inhaftierung während des Krieges studierte er an der Prager Akadamie der musischen Künste Klavier und Komposition. Ab 1955 wurde er mit Vorlesungen am Lehrstuhl für Musikwissenschaft der Karls-Universität in Prag betraut, seit 1990 ist er ordentlicher Hochschulprofessor für Komposition; das Schwergewicht seiner Tätigkeit liegt auf dem kompositorischen Schaffen. Ausserdem widmet er sich auch der Konzerttätigkeit, hauptsächlich als Interpret seiner eigenen Werke und als geschätzter Improvisator auf dem Klavier und der Orgel. Auf diesem Gebiet tritt er auf Festivals in Europa, Amerika und Australien auf. Trotz seiner Vielseitigkeit widmet sich Petr Eben mit besonderem Interesse zwei Gebieten: Dem Chorschaffen und Kompositionen für Orgel. Ich schrieb A Festive Voluntary als Auftragswerk für das Southern Cathedrals Festival zur Einweihung der neuen Chichester-Cathedral-Orgel. Mir war sofort klar, welchen Charakter das Werk im Wesentlichen haben würde: Festlich sollte es sein, fröhlich und die Fülle und Vielfalt der Klangfarben des Instruments zum Ausdruck bringen. So entschied ich mich für eine ineinander fließende Variationsreihe mit unterschiedlichen Registerkombinationen, in denen besonders die Zungenstimmen Anwendung fanden. Auf meiner Suche nach einem geeigneten Thema, das eine Verbindung zwischen meinem Land und Großbritannien herstellen könnte, stieß ich auf das mittelalterliche englische Weihnachtslied „Good King Wenceslas“, in dem unser König und Nationalheld besungen wird. Diese Melodie legte ich meinem Voluntary [Orgelstück im anglikanischen Gottesdienst] zugrunde in der Hoffnung, dass sich die in der Melodie äußernde Freude auch in meinen Variationen widerspiegelt. Die Komposition „Amen, es werde wahr“ entstand auf Bestellung des deutschen Möseler-Verlags für den Orgel-Band mit dem Titel „Ein Choral im Spiegelbild zeitgenössischer Komponisten“. Der Herausgeber teilte die neun Strophen des „Vater-unser-Liedes“ unter neun Komponisten und bat sie um musikalische Umsetzung. Damit sollte eine stark kräfigen Luthertextes geschaffen werden. Mir wurde die letzte Strophe zugewiesen, die mit den Worten „Amen, es werde wahr“ beginnt. Zu diesem Choral-Thema habe ich einige festliche Variationen geschrieben, welche den Abschluß der neunteiligen kollektiven Komposition schaffen. Evangelische Choräle: Die Kunst der Improvisation, ehemals fester Bestandteil des Könnens eines jeden guten Musikers, ist heute mit zunehmender Spezialisierung seitens der Komponisten wie der Interpreten fast völlig aus den Konzertsälen verschwunden. Einst gehörte die Improvisation zu den ganz selbstverständlichen Bestandteilen der Ausbildung jedes Ausführenden. Heute ist das nicht mehr so. In einem Fach hat die Improvisation jedoch überdauert und ist Bestandteil des Unterrichtes wie der Konzertpraxis geblieben: im Orgelspiel. Hier ist die historische Kontinuität des Improvisierens nicht abgerissen, während sie in anderen Fachrichtungen – mit Ausnahme des Jazz – praktisch ausgestorben ist. Ich halte dies für sehr bedauerlich, denn die Improvisation zählt zu den hohen musikalischen Freuden. Nur weniges kann diesen Genuß ersetzen, sich ans Instrument zu setzen, die Noten beiseite zu legen und sich mit dem Instrument selbst zu unterhalten. Allerdings gibt es für das Improvisieren drei grundlegende Voraussetzungen, von denen nur eine angeboren sein muß: ein harmonisches Vorstellungsvermögen. Wem diese Fähigkeit nicht gegeben ist, muß zur Harmonisierung einer Melodie oder zu anderen Modulationen über die Beherrschung der Harmonielehre gelangen. Dies ist jedoch für ein flüssiges Improvisieren zu langwierig. Die beiden anderen Vorstellungsvermögen kann man sich aneignen: zum einen die Gewandtheit auf dem Instrument und zum anderen die ihr nahestehende Spontaneität im Denken des Improvisators respektive die Kenntnis und Fähigkeit, die Regeln motivischer Arbeit, des Formenaufbaus, die verschiedenen Stile und ähnliches schnell anzuwenden. Natürlich verlockt die Orgel am meisten zur Improvisation. In den Jahren nach 1960 wandte sich die Evangelische Kirche der Böhmischen Brüder an mich. Damals wurde eine neue, umfangreiche Ausgabe des evangelischen Kanzionals mit einigen hundert Chorälen vorbereitet. Man verwendete natürlich sehr viele dieser Choräle in Harmonisationen früherer Editionen, die alle in vierstimmiger Homophonie geschreiben waren. Handelte es sich hierbei also um Bearbeitungen der vorangegangenen Jahrhunderte, so wollte man gerade deshalb in das neue Kanzional einige Choräle mit neuer, etwas modernerer Begleitung aufnehmen. Man bat mich daher um eine Reihe von Choral-Sätzen in zwar neuerem, doch nicht ausgesprochen dissonantem Stil. Jedem Choral ist auch ein kurzes Improvisationmodell beigefügt, um anzudeuten, wie man verfahren kann. Natürlich geht es hier nicht um konzertantes Improvisieren, sondern um Vor- und Zwischen-spiele zu den Chorälen. Wenn ich bei einem Improvisationskonzert ein Thema zitiere, so begnüge ich mich nicht mit ihm, sondern wende mich eigenen Motiven zu. Hier aber konzentriere ich mich ausschließlich auf die Motive des jeweiligen Chorals und ende auch stets in dessen Tonart, damit sofort eine weitere Strophe gesungen werden kann. Ich schreib Sonntagsmusik im Jahr 1957–8, zu einer Zeit da bei uns durchaus kein Interesse für Orgel bestand, ganz im Gegenteil. Konzerte waren in den Kirchen allgemein verboten und in den Konzerthallen gab es Orgeln ziemlich selten. Alle meine Kollegen schüttelten den Kopf und sagten, es sei ein Unsinn. Aber ich fühlte, daß ich etwas für Orgel schreiben muß, es war mir ein ganz tiefes Anliegen; doch war ich mir bewusst und rechnete damit, dass die Partitur in meiner Schublade liegenbleiben wird. Doch wider allem Erwarten wurde das Stück bei uns bald darauf uraufgeführt und gedruckt und erschien dann auf vielen Schallplatten verschiedener Länder und wurde so meine meist gespielte Komposition. Und damit hatte ich nicht im Geringsten gerechnet! Mit dem Titel „Sonntagsmusik“ – Musica dominicalis – wollte ich andeuten, daß es sich bei diesem Werk nicht um eine alltägliche, sondern festliche künstlerische Aussage handelt Formell ist das Werk eine Orgel-Symphonie mit vier Sätzen. Der 1. Satz arbeitet sehr konzentriert mit einem gregorianischen Thema „Ite, Missa est“, was für jeden Sonntag des Jahres gebraucht wird und deshalb mit der Sonntagsmusik eben zusammenhängt. Ich benütze hier beide Motive dieses Themas als markanten Kontrast: „Ite“ beginnt im Tutti, „Missa est“ im Piano, später dann so, daß das „Ite“ im Pedal erklingt und dazu das „Missa est“ in den Manualen. Natürlich arbeite ich mit den gregorianischen Motiven frei musikalisch, sodaß ich sie auch in schnelle Rhythmik umwandle. Am Ende des Satzes erklingt eine Kadenz in Bitonalität und nach ihr hört man dann als Abschluß das Thema wieder in Tutti mit vollen Akkorden. Der zweite langsame Satz bringt in leiser Dynamik zwei eigene Themen, die zwar keine Zitate sind, trotzdem aber der Gregorianik nahe sind. Im weiteren Verlauf kommt es zu einer mächtigen Steigerung und bei diesem Höhepunkt mit glockenhaften Klängen erklingt nach einigen Akkorden wieder das Thema des ersten Satzes. Wie die beiden Phantasien durch ein gemeinsames Thema verbunden sind, so gehören auch die beiden letzten Sätze innerlich zusammen. Bei der Symphonie ist der 3. Satz meistens ein Scherzo. Hier ist es ein dauernder markanter Rhytmus; mit diesem Satz brechen die in der Bergpredigt und in der Johannesapokalypse geschilderten Kriege und Kämpfe über die Menschheit herein. Zu dem gleichbleibendem Rhythmus erklingt ein Thema, abwechselnd Oberstimme u. Pedal. Das „Finale“ basiert auf einer freien Verwendung der Sonaten-Hauptsatzform mit Exposition, Durchführung des thematischen Materials und Reprise. Am Anfang erklingt in einer virtuosen Baßfiguration ein kurzes Bild für das sich entfernende Kampfesgetümmel, dann hört man – auch von der Orgel – eine dramatische Trompetenfanfare, welche nach geschlagener Schlacht die Überlebenden zusammenruft. Als Seitenthema erklingt im Pianissimo das „Kyrie, lux et origo“ aus der Ostermesse. Manchmal arbeite ich mit einem Thema der Gregorianik so, daß ich die Intervalle vergrößere und sie in andere Tonalitäten führe. In der Durchführung erklingt wieder das Kampfesgetümmel, bei der Reprise wieder das erste Thema, allerdings in mächtigem Klang, wie im Manual, so später im Pedal, und in der Coda kommt ein neues Thema, als Sinbild aller positiven Kräfte der menschlichen Existenz. Es ist der Anfang der berühmten Marianischen Antiphon „Salve Regina“, welches das ganze Werk hymnisch ausklingen läßt. Dies ist der endgültige Sieg des Guten über das Böse und schwingt sich auf zu einem hymnischen Lobpreis des Schöpfers.